Now that we have assembled the various parts, it’s time to build the unit. We start off with the central stalk which is attached to the plunger unit. Next we place the upper and lower carousel haves onto the stalk. Be sure they are oriented correctly as seen in the picture. Next we slide the stopper assembly over the central shaft. The stopper should be oriented such that the gap in the stoppers aligns with the plunger. The stopper should slide smoothly along the central shaft. Next we attach the carousel mount. This attaches to the shaft using M5 screws and T-nuts, but don’t tighten it down. We want to be able to slide it into position. 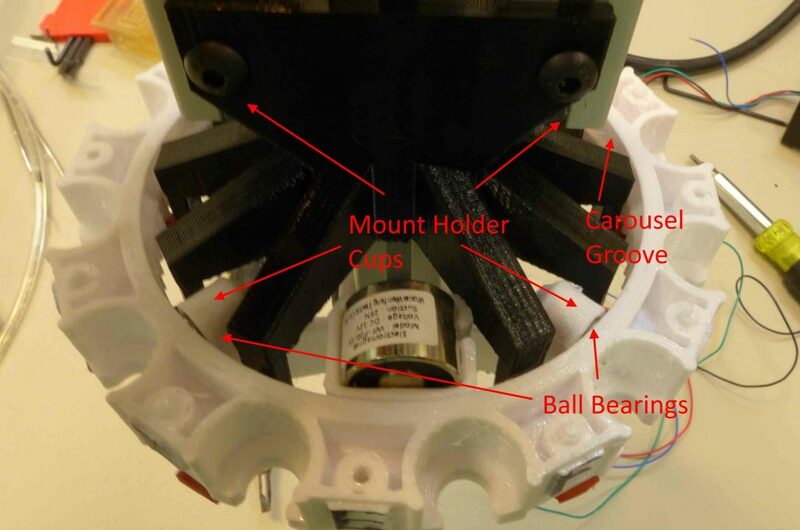 The carousel should be positioned such that the electromagnet faces in the same direction as the plunger and slides through the gap between the stoppers. We are ready to attach the carousel to the carousel mount. This is done using 4x 1/4″ ball bearings. The carousel mount has 4 cups. Each of these will hold a ball bearing and that ball bearing will roll along the groove in the carousel bottom. Attaching the ball bearings can be tricky. The easiest way I have found is to use gravity. Place a ball bearing at the bottom of the groove. 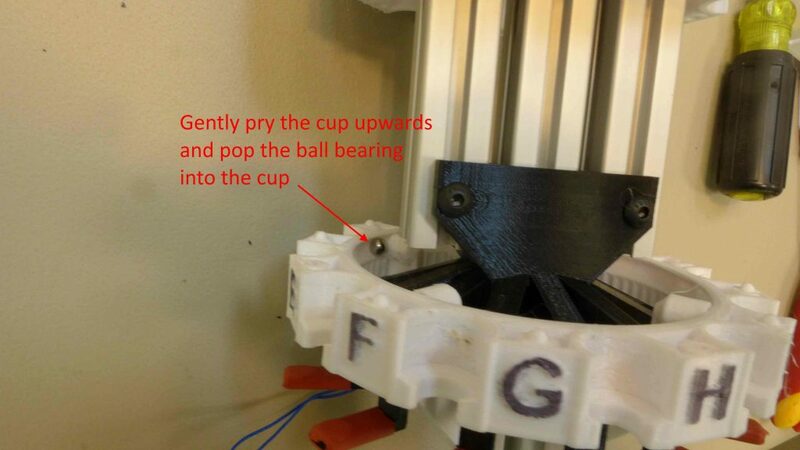 Push on the corresponding mount arm to make space for the bearing to pop into the hole. Repeat for each of the ball bearings. 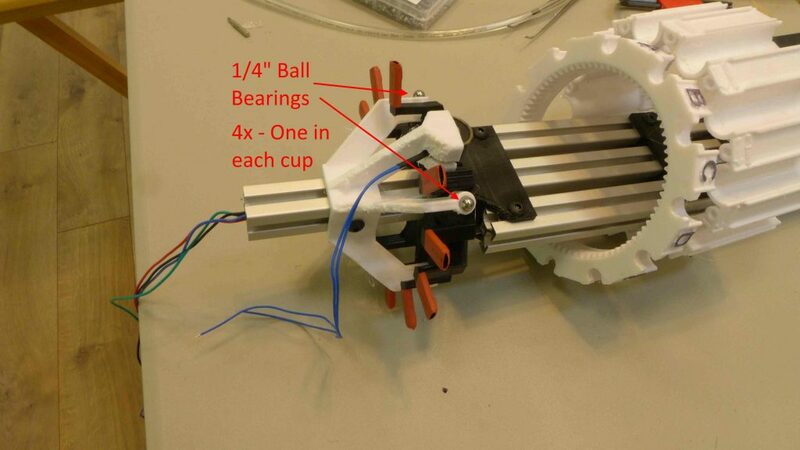 When completed there should be a ball bearing in each of the cups and the bottom of the carousel should rotate smoothly. It doesn’t need to be silky smooth, but it should be easy to rotate. We can go ahead and attach the carousel motor mount. to the shaft using M5 screws and T-nuts. Keep them loose to allow adjustment. 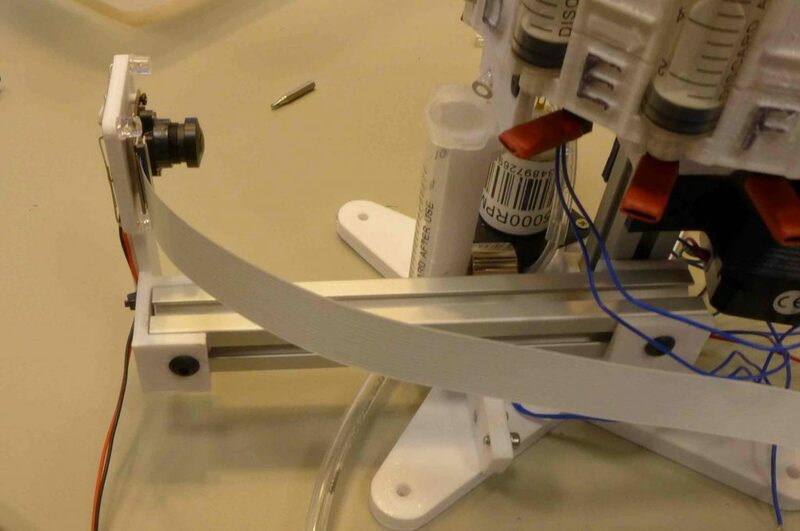 The carousel stepper goes in the back. 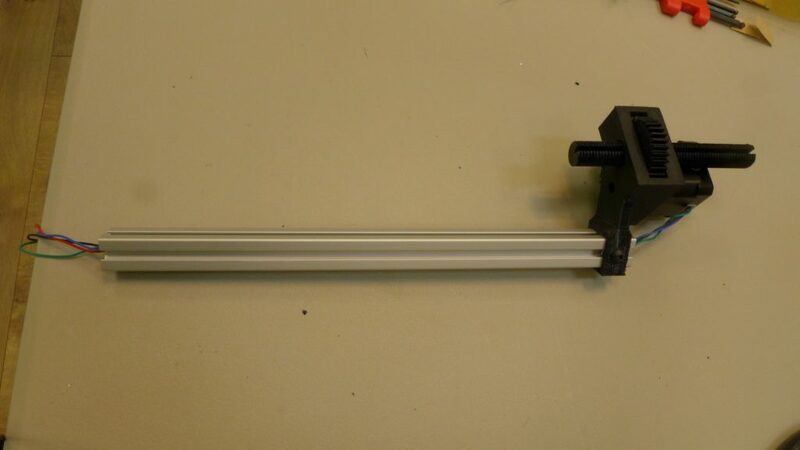 Next we want to attach this complete assembly to the mixer stand. 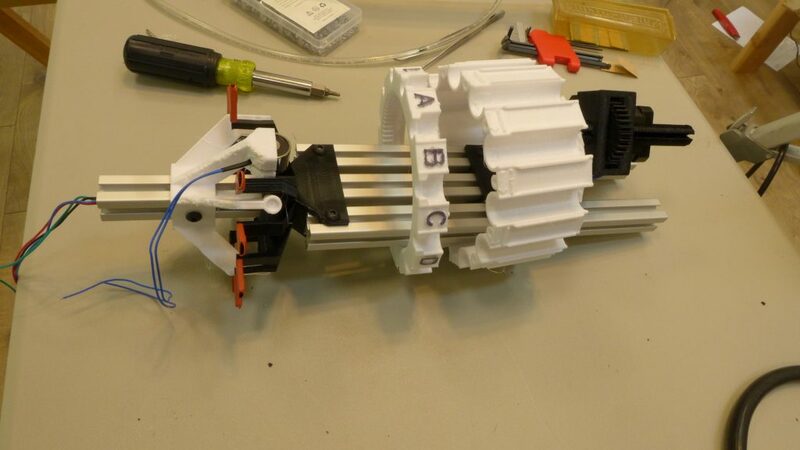 The stepper motor wiring from the plunger will exit out of a small hole in the stalk receiver. Insert the shaft into the mixer stand such that the plunger faces in the same direction as the mixer. Secure in place with M5 screws and T-nuts. The upper part of the carousel can be joined to the bottom part. Use 4 #4 screws or M3 self tapping screws to join the two halves together. 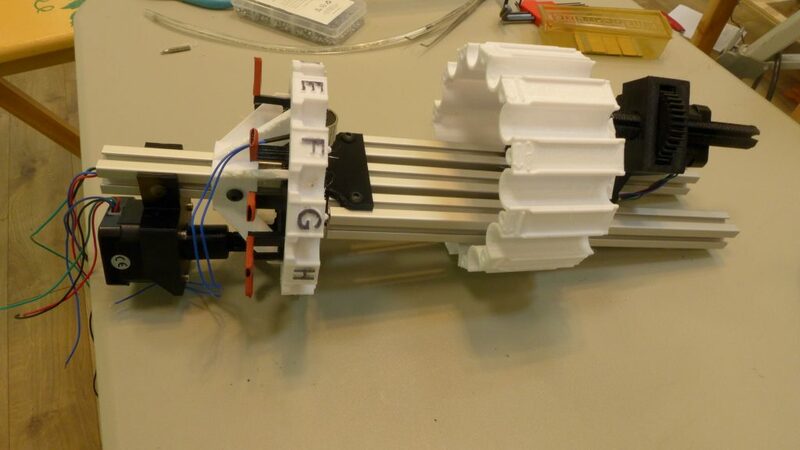 Next we need to align the height of the parts. 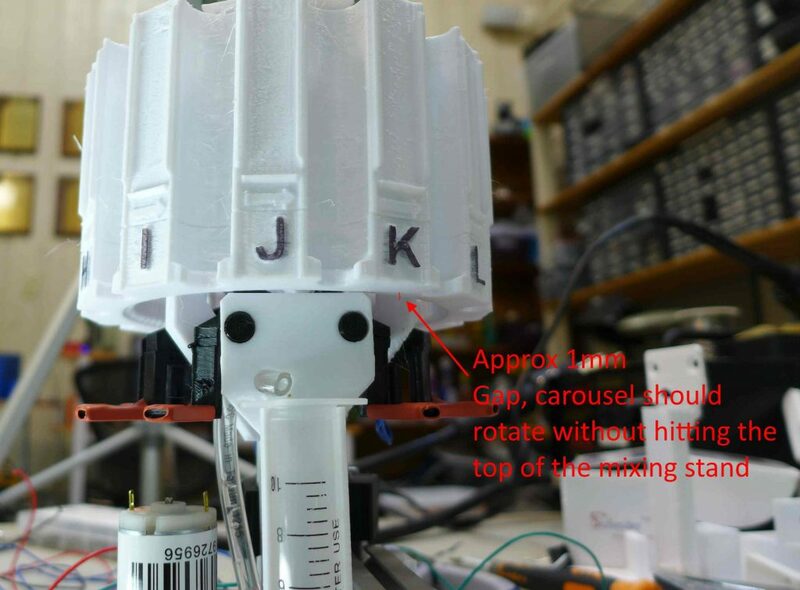 The carousel should sit just above the top of the mixer (about 1 mm). It should be close, but they should not interfere. Raise the carousel mount to the appropriate height and tighten in place. 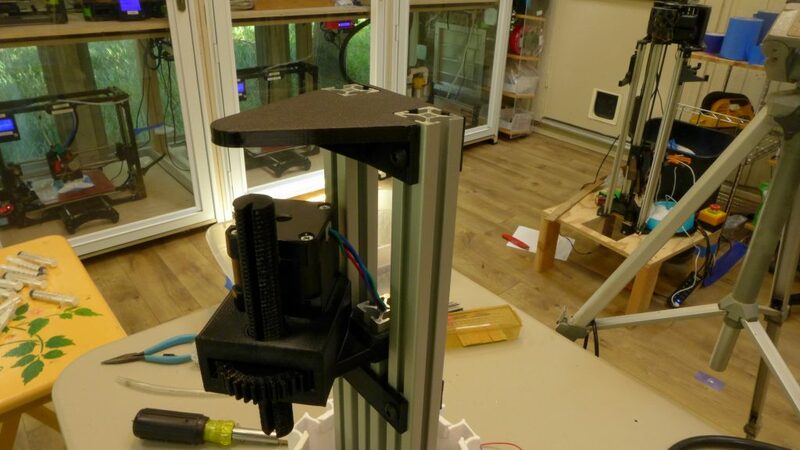 Next raise the carousel stepper mount to the appropriate height. It should mesh smoothly with the inside gear. 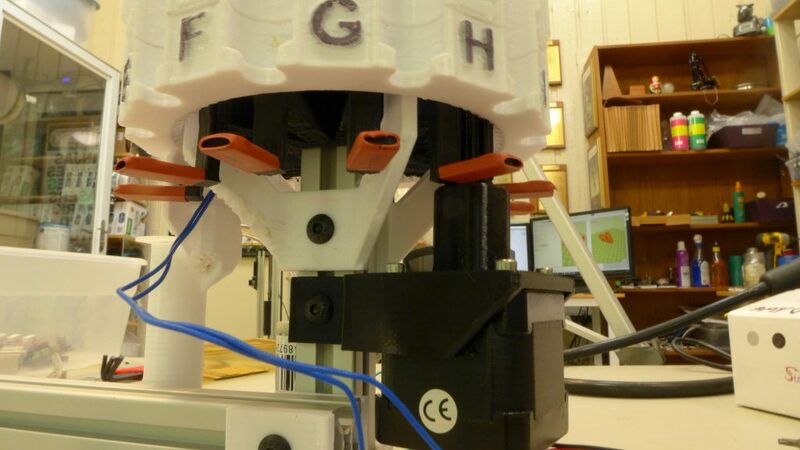 The stoppers will need to be raised to set the carousel mount in position. Next install the plunger catch. 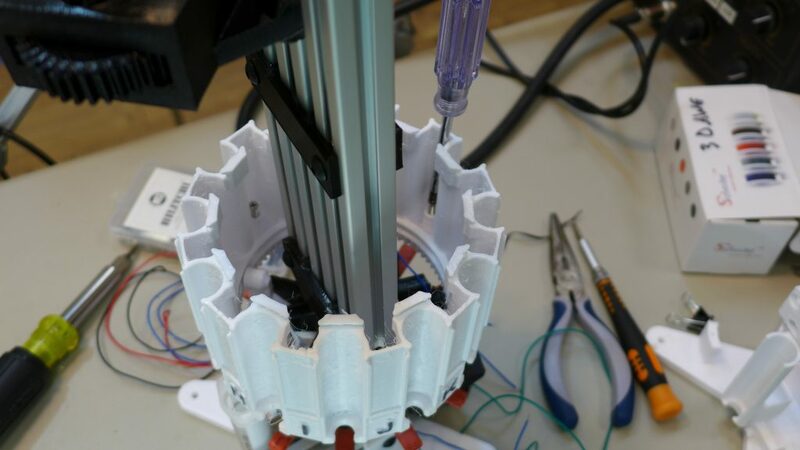 It attaches to the top of the plunger assembly. 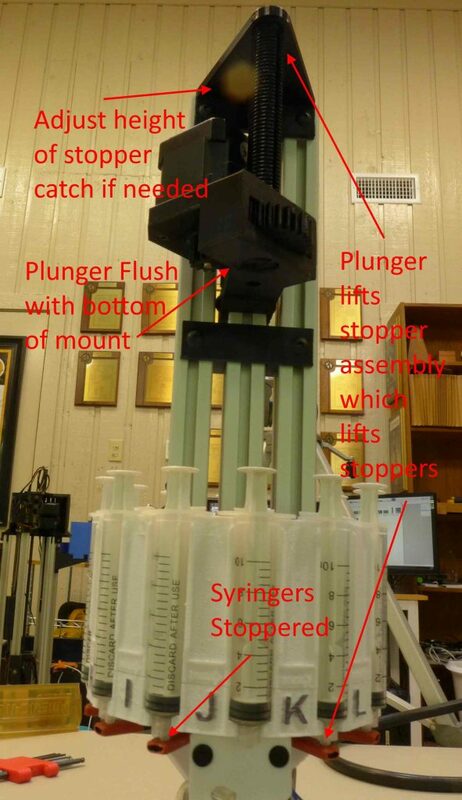 Test the positioning of the plunger catch. 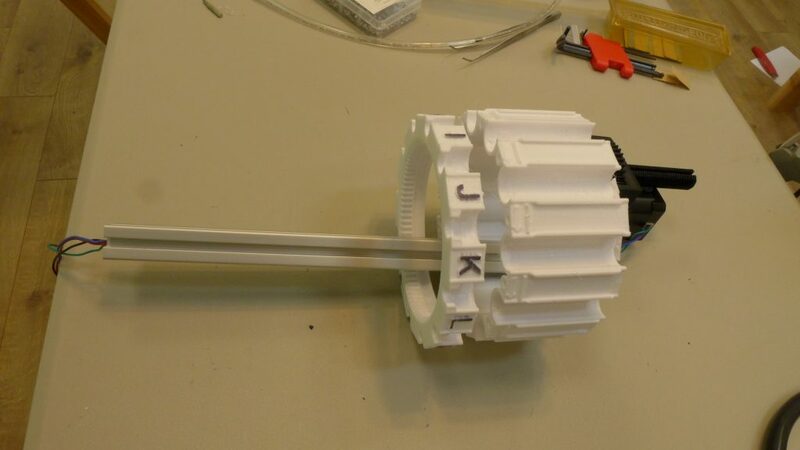 The plunger catch is attached with M5 screws and T-nuts. 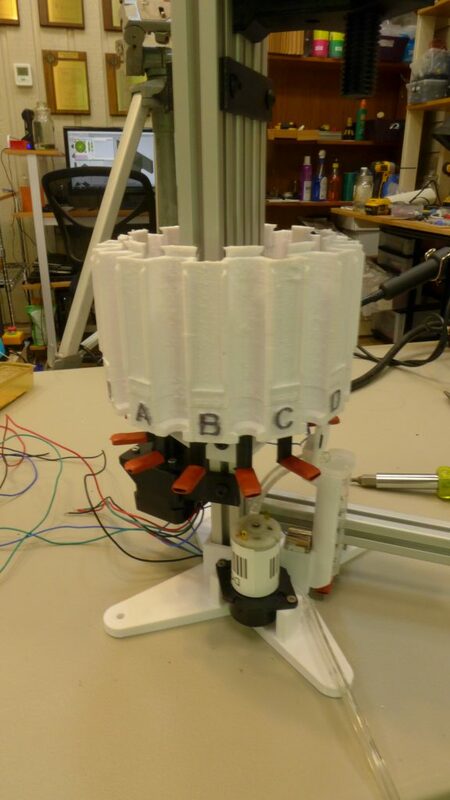 When the stepper plunger is raised to the top, the stoppers should close the ends of the carousel. Having the top of the catch flush with the top of the aluminum seems to work pretty well in my experience. 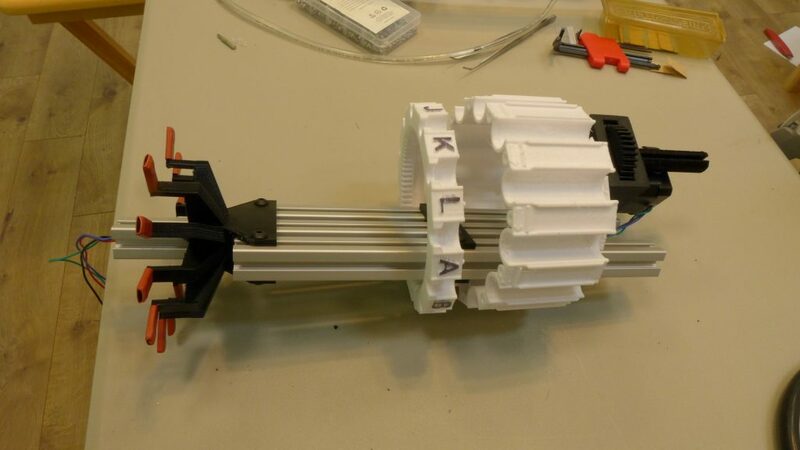 To test this, you will need to load the carousel with syringes. Once you are happy with the position of the catch, then tighten it into place. The last step of the build is to attach the camera mount to the camera arm. 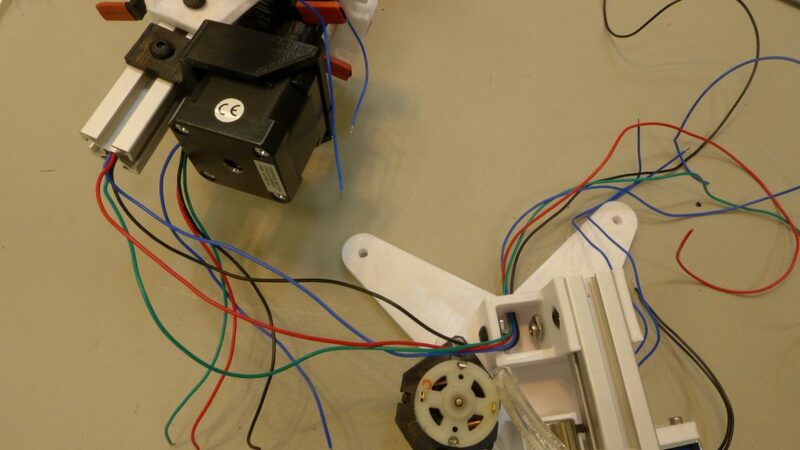 The cable should exit on the side of the extruded aluminum. All the wiring should be tidied up. I used a 1″ sheath to wrap the wiring in that went into the electrical box. Congratulations, you have completed the mechanical part of the build.